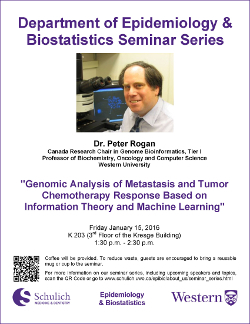 Dr. Peter Rogan, "Genomic Analysis of Metastasis and Tumor Chemotherapy Response Based on Information Theory and Machine Learning"
"Genomic Analysis of Metastasis and Tumor Chemotherapy Response Based on Information Theory and Machine Learning"
Coffee will be provided. To reduce waste, guests are encouraged to bring a reusable mug or cup to the seminar. All are welcome. View the complete Seminar Series Listing.